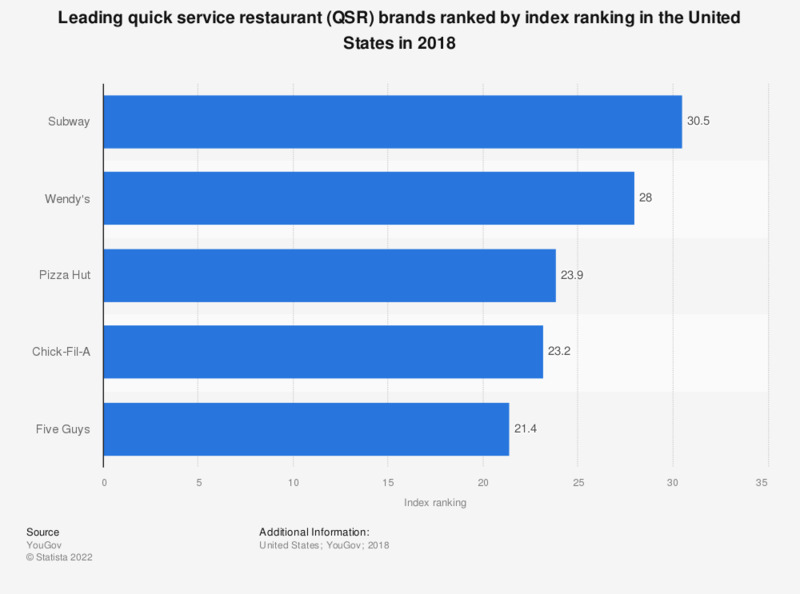 This statistic shows leading quick service restaurant brands in the United States ranked by average index ranking in 2018. YouGov's brand Index 2018 results show that Subway ranked highest with a score of 30.5. In 2017, Pizza Hut was the second pizza restaurant chain in the United States in terms of sales. * YouGov BrandIndex’s Index score is a measure of overall brand health which takes into account consumers’ perceptions of a brand’s quality, value, impression, satisfaction, reputation and whether they would recommend the brand to others. The Index Rankings list shows the brands with the highest average Index scores between July 1, 2017 and June 30, 2018. ** Index scores can range from 100 to -100 and are compiled by subtracting negative feedback from positive. A zero score means equal positive and negative feedback. Everything On "Quick service restaurant brands: Wendy's" in One Document: Edited and Divided into Handy Chapters. Including Detailed References.